Nebraska: Equality before the law. Nebraska is pretty much how I pictured it: lonely stretches of road, endless rows of corn. It was a little hillier than I expected, but then again I was only in the eastern part of the state. But the sight of corn as far as the eye could see while driving on US-75 and NE-2 is something I won't forget. 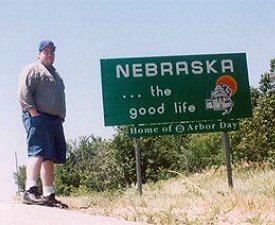 I visited Nebraska while I was in Kansas City on business in June 2001. I was out there for two weeks and the only one there that Saturday morning, and I had the rental car all to myself. So I hit the road. I was in Topeka that forenoon, Nebraska in the afternoon. I was hedging about going to Des Moines but ran out of energy and out of daylight once I crossed the Nebraska-Iowa line. While in Kansas, I had been listening to ESPN Radio on the sports radio station in Kansas City. By the time I got to Nebraska the AM signal was too weak, and what I could hear was about the NFL draft which didn't really interest me. So I turned off the radio, and having not brought any tapes with me from home, I drove most of the way in silence. If you've been reading this far, you'll remember that when I was at the Florida State Capitol in Tallahassee I found that my tripod was broken. You'll notice that this sign picture was taken from a funny angle. That is because my camera was resting on US-75, propped up precariously by my wallet. So if it looks strange that's because it was taken from one inch off the ground. It was also the last picture I took wihout a tripod as I got a new one in Lincoln about an hour and a half later. The tagline under the sign says "Home of Arbor Day." Someone once asked President Lincoln if the city of Lincoln, Nebraska, was named after him. "Well," he answered, "it was named after I was, if that's what you mean." Most cities have numbered streets. Lincoln does too. But it was kind of interesting driving west on NE-2 towards Lincoln, passing the intersection of 179th Street, especially as one who has essentially lived my whole life within 60 miles of New York City. That's because 179th Street in Lincoln is basically a narrow dirt farm road and the city is nowhere in sight. Kind of a different 179th Street than you'd find in New York. All it did tell me was that I was 17.9 miles from downtown Lincoln. Once I got closer, the city started to take form. I remember driving by a very impressive bicycle path with cantilever bridges over NE-2. I came up to a Target store where I bought my new tripod. Making a right on 11th Street I drove north through Lincoln and eventually got to Capitol Square. Nebraska's fifth capitol building, built in 1932, occupies four full city blocks. Its color is uniform since all the limestone came from the same area of the same quarry. The large base is said to represent the flat plains of Nebraska while the tower symbolizes the dreams and aspirations of the pioneers. The exterior art is carved into the stone, and the interior art is integrated into the marble floors. I parked at the northwest corner. It was right around 5:00 on a Saturday afternoon in June, and the church across the street was just letting out. 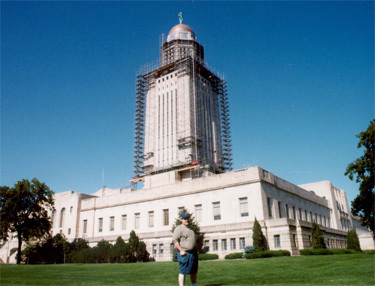 Nebraska is one of the few states the capitol of which is a tower. It looks nearly identical to the Louisiana State Capitol in Baton Rouge, though at 400 feet Nebraska's is a little shorter. Unfortunately when I got here the building was surrounded by scaffolding. I think this is the first time I encountered this in the two years I've been doing this; I remember seeing the scaffolding around the U.S. Capitol the first time I went to Washington D.C. in 1985. Since the building is so tall, I had to take a really wide shot. In fact, I took pictures of myself in front of the capitol in three different locations because it was hard to judge which one would come out the best. This is looking north towards the South Front. I had to walk about 50 yards down this street in order to fit the entire building in the shot. The Governor's Mansion is just behind the trees on the left. On the opposite end of the square and across the street is Centennial Park. It is a small tree-lined plaza with a downward terrace-like slope and a series of fountains on each step and flanked by benches. This page loaded in 2.508 milliseconds.